Combine flour, brown sugar, coconut and melted butter. Once combined, press into a greased/lined lamington tin. In a small saucepan, add condensed milk, golden syrup and butter. Once the butter is melted, increase heat till simmering(slow boil) and cook for 5 minutes. Pour onto baked base and put back into the oven for another 10 minutes. While base is cooling, melt dark chocolate (either in the microwave or over hot water, bain-marie style). 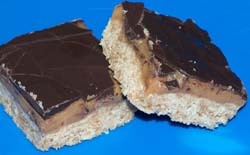 Once melted, spread over caramel slice and place in the fridge to set.